Are you tired of the nasty looks from people on the trails as you effortlessly glide up a steep climb? Does it make you sad that people don’t understand that eBikes are really freaking fun? Do you ever wish your eBike battery was invisible? With the Kona E-Mo, your eBike battery is as good as invisible. Our patented camo technology hugs your battery with a perfectly matched pattern so it just disappears into the background. No more judgy looks! Our patented stretch technology has been scienced to fit all eBike batteries, no matter what brand of bike you ride. It’s weatherproof skin ensures your battery stays warm and dry. Just like a baby seal! 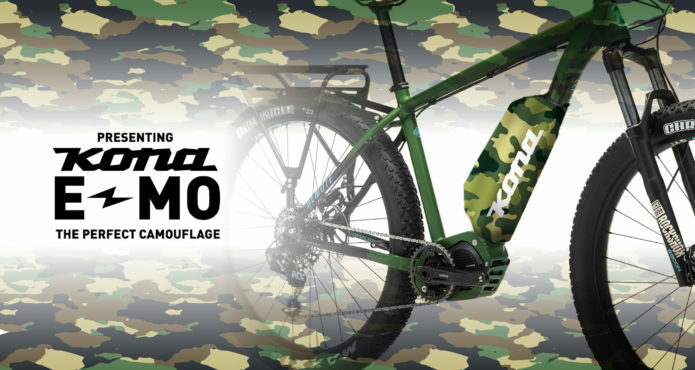 Kona E-Mo is designed with your style in mind and comes in four great colorways. For the old-school rider, we’ve created classic infantry. 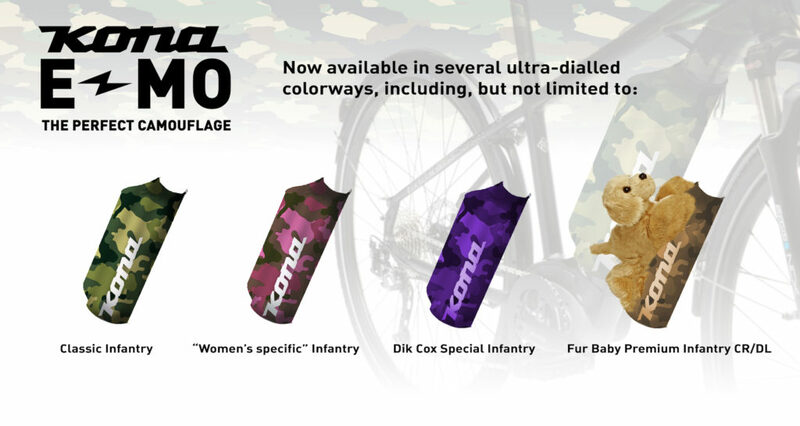 Dik Cox Special Infantry is perfect for the person looking for a little more flair on their bikes. For the ladies, we’ve created a super unique “women’s specific” pattern that is sure to be a hit among the double X chromosome crowd. After all, women LOVE pink! But wait! There’s more! For those of you who just have to have your adorable little pooch with you on every ride, we’ve created a special edition Fur Baby Premium Infantry CR DL. 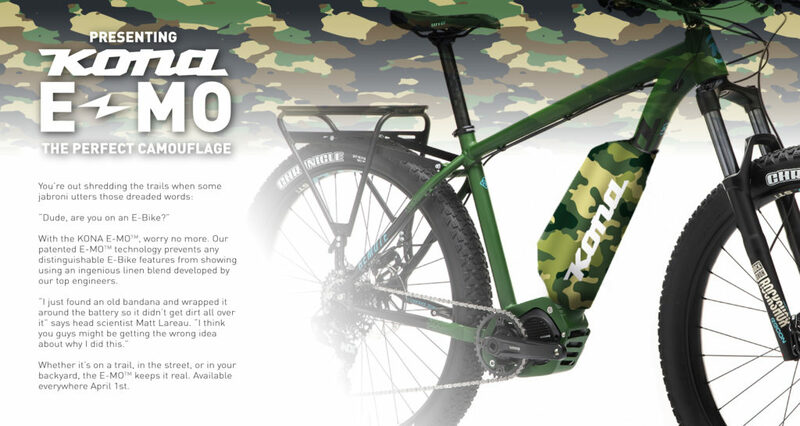 Now your bike blends into your dog. What could be better? So while others are struggling with their e-Go, you can be happy with your E-Mo! Limited quantities available. Buy now!